I last wrote just after Lisbeth had left to return to Colombia on 18 January. Elisabeth, our Saxaphone playing friend from N Jutland, came on board and we sailed together to Ilha Bom Jesus da Cases, anchoring for the night. Next day we sailed on to Itaparica where Gabriela Aranda from Chile and her Brazilian boyfriend Alan Christi joined us at anchor bearing charcoal, beef, and Chilean wine. We had a nice BBQ on board and chatted a long time. Next (22nd) morning we swam twice before sailing back to Salvador. I then spent a couple of days locating and fitting a through-deck fitting for the anchor up/down remote controller. I finally found this in Electrica e Electronica Popular near to Sao Joaquim market. In Salvador there are clusters of shops all in more or less the same business and side-by side in particular streets and districts. But e-popular was full of stuff, and not expensive. Yann, the solo french sailor friend in a lovely S&S from the 1960s, was away sailing with his daughter Clara and Mercedes a sailing friend from Patagonia. He called asking if he and Clara could stay the night on Svalen on 24thas his anchor was stuck, and Clara needed to catch a flight back to France. That was very nice, and we had a nice dinner and chat together on board with wine . On Friday, Clara left early, and Yann caught a ferry back to his boat in the middle of the day. Yann is now en route to Cape Town from Rio, once more on his own. Meanwhile I got to know the young Dutch couple Bram and Petra (ON the small steel sloop HAFSKIP: see sy-hafskip.blogspot.com) even better, because Bram soldered the electrical connections to the anchor remote for me with his efficient kit. So Bram and Petra came for a supper of stuffed aubergines that night, and Elisabeth also joined us. On Saturday, I gave Bram and Petra an extended tour of the old town as far as Sao Antonio. We had Acarajé at Liu’s stand in the square and later ate as cheaply as we could at a too-expensive restaurant just up from Caflier (which had a very long queue!). 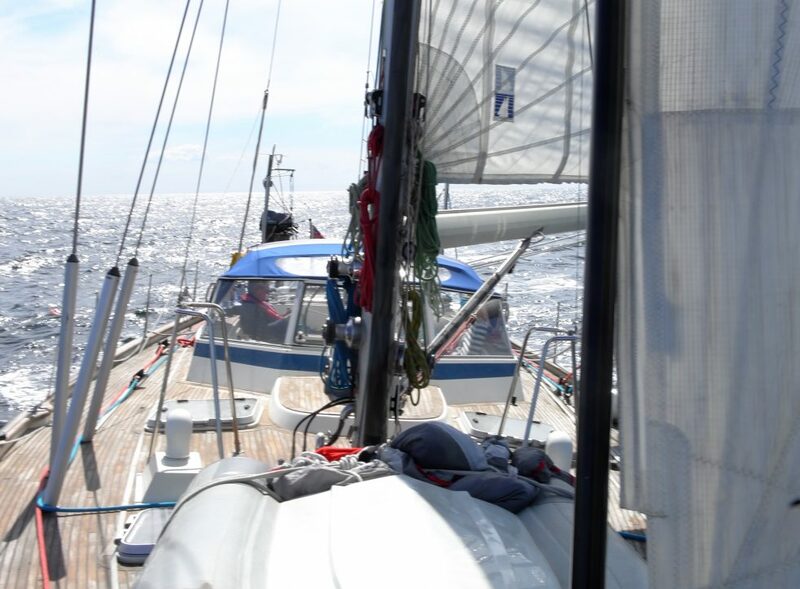 S/Y Hafskip: Bram and Petra en route to Patagonia. JMB. My friend Viviana who was supposed to be coming sailing next week writes that both she and Alice now have whooping cough, so it looks as though I will be without crew for most of February. Elisabeth returned to continue her pedagogy studies in Aalborg, but she visits quite regularly before leaving, also with various friends from Chile and Brasil. Her boyfriend is also returning from Cuba, where he has been playing his Bass. I think they make a good couple, and they plan to get married in July. A couple of new boats arrive from France. Siegfried was one of the crew, and the captain told me he had been talking about a Hallberg Rassy 49 all the way across the Atlantic, only to find me on Svalen on arrival! He, Siegfried, plans to sail around the world with his wife after he retires from the French air force next year, and his current crossing was a test. Of course I invited them on board for an inspection, and have since answered a lot of questions and sent many photos, because he is a potential buyer for Svalen after we get home. Yes Karen and I have decided to sell Svalen as she needs to be sailing oceans and not stuck in a harbor, and we cannot afford her now that I am really retired. We also still have Aldarion in dry dock in Denmark, and she will be fine for the sailing we plan to do in future. She is wooden, and although a classic style, she is very hard to sell. I will also tell Kristian and Diego who have also expressed an interest in Svalen. At the end of January, we were still tackling the fridge and freezer, with help from Mario. However, the fridge now works well, but the freezer does not, and it seems that a new compressor is needed, which is impossible to find here. By the beginning of February, it seemed all the friends and family who had been around had left again, and suddenly it was rather lonely! Bram and Petra left for Uruguay, via Rio. On 6thFebruary, I sailed solo to Itaparica and managed to get into the inner part of the harbor by arriving at high tide. There I got tucked in. I met a nice sailing couple from Rio – Lucia and Marcello – who had good English, and helped me get settled. Lucia is a restaurateur, owning the quite well known Celeiro Culinaria in Leblon for 30 years, and Marcello has a sailing school and deals in yachts. We had an evening together later on, before they left to return to work. Local boat handiman, Irismo, offers to scrub the weed and shells off my hull, clean the topsides, and clean the dinghy all for Rs 300 (about 60 pounds), so I jump at the offer. He spends most of two days t this and is very cheerful, working hard and doing a good job. We are now amigos. I also met another French couple Isabelle Harlé and Ariel Waksman on Skol(www.skol-az.net). Skol is a modest sized aluminium sloop designed by Isabelle’s grandfather (a naval architect) in La Rochelle. They have been sailing the world for five years, most recently spending two years in Patagonia exploring the remote areas in Southern Chile and Argentina. They catch and cure their fish, using salt. They also have a canner on board. They came to a deal with the local Poussada of chocolate fame to pick up fallen mangoes in the large garden, and have canned a lot of mangoes for the next sail. And they have sourdough culture and kefir grains to make bread and kefir (kossak mare culture yoghurt!). I was the beneficiary of many these goodies, including Kefir grains, and sourdough! But sailors inevitably sail on. Isabelle and Ariel left with the tide early this morning to sail north to Jacare, after which they will also sail to the Azores where we may meet again in May or June. Meanwhile I have sewn a small repair in my mainsail which might have got worse when we next sail, cleaned the boat inside, kept up the laundry and stores, and worked a bit on our next fundraising campaign, which will be about cleaning the oceans. My next crew, Brazilian-Swede Jan, is helping with that a lot, and is even bringing T-Shirts for the purpose. Trying not to think about the awful-ness that is Brexit, and its personal consequences for me, which in addition to everything else, involve both trouble and expense. It makes me too angry! I have also finished four books – the wonderful Out of Africa by Karen Blixen, which Karen brought me for Christmas; the powerful book about the Japanese wartime effort to build the Burma railway linking Malaysia to China called The Narrow Road to the Deep North by Richard Flanigan; Wliiam Moberg’s first volume of The Emigrants, about the large emigration from Småland in Sweden to the USA in the first half of the 19thC, and a couple of new Rebus books by Ian Rankin. Now I am half way though Alvah Simon’s book about sailing to the Canadian Arctic via Greenland, North to the Night. I will soon run out of books, but there is not much time or energy for reading when sailing. I especially enjoyed Karen Blixen’s account of the night skies in the Kenya highlands – so like those in mid-Atlantic, dark, clear and starry! But all of the aforementioned books are excellent! Thankfully Jan will arrive on 25thFebruary, and on 26thwe will talk to the local Rotary club about doing something together on Ocean clean up, and also hear about their social projects in Salvador. We will leave for the north on 28th, so studiously and advisedly avoiding the biggest party in the world, which is said to be Salvador’s week of Carnival. We still hope that Viviana will also join us at least to Jacare, and hopefully all the way to Fortaleza. Here is the plan for homeward bound between here and the Azores, in brief. Cabdelo/Jacare to Forteleza, 353 nm non stop. Leave Cabadelo on 7th March to arrive in Fortaleza on 10th. Forteleza, Brazil to Cayenne, French Guyana.1001nm (Rhumb line. Leave Forteleza Leave 12 March 2019, arrive by 23 March. Thomas Kringlebotn Thiis and Killian are crew. French Guyana to Azores, About 2400nm. Depart about 10 April 2019, arrive around 30 April. Janne Olsson is crew. 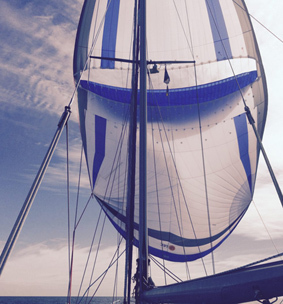 I am looking forward to sailing again, and to a visit from Karen in the Azores. meanwhile, I usually have a morning and evening walk or cycle around this pretty village at the north end of the Island where the small Marina is. The Dutch Fort, N Itaparica. Built 1711 by Dutch ‘Raiders’ who must have been here a while! Nice entrance with old Portuguese tile work well preserved in Itaparica. Photo JMB. Three weeks vacation on Svalen, Bahia in Brazil – such a nice experience. Why? Because our little family got together, Morten, Lisbeth, John and me which is not very often! Because Brazil shows such a diversity of people, food, music and another approach to life! Because exploring the world from a sailing boat is connecting continents, people, and experiences. Brazil is a real melting pot: The people come in all sorts of colours and shapes and classes, but what seems to unite them is music, exciting (street) food, mangos and a relaxed and informal lifestyle with few norms and an incredible welcoming attitude to us. However, racism still exists. According to some of our sources about 60% of the populace is illiterate (less than 4 years of school). And as life is easy, there are only marginal needs for housing, clothes and with cheap and accessible rather healthy food it is rather easy to keep people at their classes – little need for mobilisation through knowledge or power in order to achieve more equality! We spent time on the boat as a family, sailing between the islands Ilha Parica and Bom Jesus, in the bay Todos o Santos, and exploring local coastal life. Mornings always with mangos, oranges, passion fruit if we we are lucky and müsli. The small local shops were our favourite places to shop – getting the local deals and always fun to check out what they could offer. The best experiences were the large beef carcasses, just being cut according to our need. Had also a small dive to see a small coral reef and especially long swims which in the end nearly ended to be together with Dolphins hunting for fish. On Christmas day we had a little celebration dinner, pebernødder from DK (two varieties as my parents compete) so we voted and 3 in favour of the Hedegaard variety and 1 in favour of the Bjerregaard variety! And with gift exchanges of books and Havana sandals! The many dinners – as the evenings were the most preferred – in Salvador, on the boat or on Ilha Parica gave rooms for some nice talks – especially between Morten and Lisbeth, who had fun together. Salvador is a large city. It was the entrance for the majority of slaves to South America, and so roughly 80% of the population here is black today, often working in the service industries. The beautiful old town of Pelourini with weathered Portuguese architecture was a nice experience with lots of local food and loads of tourist shops where all sorts of drums, leather, African and Brazilian fabrics of all types and colours, dangles and dingles and services to braid one’s hair were sold! But also great music at the squares in the evening, Capoeira and things for all the senses. We experienced the more well-off class of Salvador! Got access to the yacht club through Viviana and immediately got invited from a older couple to join them for the day. I think this is typical Bahia. Despite all advices about crime, mugging etc. we have met only very friendly and helpful people here – from the Uber taxidriver to the very well off ! On a sailing boat being in harbours you meet a lot of people travelling across the world. This is a world on its own – culturally great. French Yann e.g. sailed alone across the Atlantic, was finished with the easy life in Europe and continued on to South Africa – in a small sailing boat, fixing things himself and not using much! Or Elisabeth from Hjørring – travelling like Lisbeth – became our new friend both in music, South American culture and sailing. And being on the sea also shows a different world – all the life that happens, whether it is transport of ice, mangos or people, if it is a small fishing boat testing the nets early in the morning or a partyboat a 3 at night. You get it all. We got a taste of the Atlantic salty sea, the hot sun, we turned brown – although John beats us all, so dark when we arrived! Lucky although that the younger the wiser in protecting your skin against this boiling sun! Thank you for three great weeks exploring Bahian life at sea. A new recipe for Svalen´s cookbook from Igor Wicken, our resident Bahian expert! Cooked by John and Igor (the source cook!) on Svalen, Thursday 13 December. Chop 1 onion and Garlic, and fry in olive oil until soft. Then add the fish, and fry on both sides lightly. Remove fish, and set aside. Turn off heat. Put a layer of the dry bread in the pan, followed by the fish, then the sliced tomatoes, green pepper and second onion. Dribble about 2 tablespoons of Dende oil, and add the spices and chopped coriander. Add the coconut milk and return to the heat, stewing for a while with the lid on. Note this is normally cooked in a clay panella de barro (clay pot). Note. Dende oil is oil from a special Bahian palm. Serve with rice (garlic rice), and farofa (manioc flour cooked in butter with onions, which is delicious and very good for sopping up all that nice liquid). Cravinho bar to drink cravinho. This is compiled from Cachaca, Cinnamon and Cloves plus sugar. A hopping, very popular, bar! Next to the two well dressed ladies with nice hats on the street selling Acarajé. This is bean cake fried in the local Dende oil with Vatapá (cream with cashews etc), shrimp and spices. Excellent! Next we walked east to a bar with chairs in the street in a small square Sta Antonio, where we had first Carne de Sol (dried meat) with fried AIPIM (Cassava, looking like French fries), with beer, and then Escondidinho (mashed cassava with cheese) con Calabresa (sausage) with onion, and more beer. Finally we walk back to the top of the old town, listened to some music in the street from a Peruvian guitar player and singer, and drank two drinks, the first a Caipirinha (limes, cachaca, sugar, ice) and then a Seriguela Caipirinha (same, but with the fruit Seriguela instead of lime.). Then we got a taxi back to the marina. Note: Salvador was at one time the capital of Brazil, for about 200 years, before Rio, and much later, Brasilia. The buildings in the old town date back to this grand period. Note: Cachaca is a type of local rum based on sugar cane, and used for mixing drinks. Many different fruits are used to vary Caipirinha. The fruit here is seriously good! This remarkable small herb garden has survived the transatlantic crossing, although the parsley faded away almost entirely after a dousing in salt water one day! The Basil has lived through it all, surprisingly for quite a sensitive plant! We arrived at Fernando de Noronha after heading for open sea 11 days earlier, the sea has been kind giving us a speed of 7 knots, give or take. The waves came from many directions, making the crossing bumpy and what sometimes felt like the flying circus of Monty Python down in the cabin. When we arrived to Noronha it was like coming to the most beautiful place, the dolphins chasing tuna jumping up from the water, what a sight, Boats anchoring outside the harbor, mostly local, a sandy beach just next to the pier. On the beach the locals were repairing their boats, along with the guests taking a swim and the local eating place, Recanto da Graca, with good cheap food and the coldest beers on the whole island. The chef of the harbour welcomed us with open arms and a smile, helping out the best he could, luckily Igor could speak Portuguese (Brazilian), for the chef didn’t speak English, but I’m sure that together we would have understood each other. The people on Noronha are kind and helpful and you have no problems being out doing the night. The buses are going around the island and go direct to the supermarket and a cashier. The town is beautiful and even though it’s touristy, mostly Brazilian, it’s small and not overdone, with small haciendas. Igor being a Brazilian and with a guitar on his back opened a lot of doors, within a few minutes of arrival he was invited to play at a reggae beach party the same evening. Igor and I went to the town that evening on our way to the Reggae concert. On our way we passed some young musicians playing on big drums and dancing the maracatu. We went along with the musicians down to the reggae concert, what an experience, they played so well. We spent 3 days on Noronha, it’s quite expensive staying there with a boat, a lot of taxes, one day to settle in, and one day to clean the boat and one day to explore the island, we all did our one exploration, Adrian stayed on the boat, John took the bus around the island and walked in the marine park, taking photos, Igor explored the waves on one of the many beautiful beaches, I went for a hike, hiking the mountain, Pica to find a rock to sit on. If you love a good hike and a good view its highly recommended, but its not easy to find the path and its not a tour so you need to ask around. We left the Fernando de Noronha sailing along the coast with dolphins playing following us on our way, while Igor was playing a “I will be back” serenade on his Saxophone. We are safely moored in Salvador de Bahia marina, got in last night after a nice sail in.. more soon, and hopefully some pics too! We are 150 miles NE of Salvador de Bahia, and should arrive there during the day tomorrow. The wind has dropped, and we are rolling about in the swell, so now keen to get to anchor or marina. Its very hot and sweaty! Looking forward to those long cold Brazilian drinks, and of course the pool at the Yacht Club! It will have taken us just over 17days and nights sailing from Capo Verde, which we think is very good – we were afraid of a week in the Doldrums! A quick update from skip.. excellent progress being made! It’s getting very hot and humid now as we are less than 10 degrees north of the equator. we are also more than 1/3 the way to our destination – we have sailed just under 500 nm from Cape Verde, and have 826 left to do to Fernando de Noronha. Better wind now, so up to 8 kts.